What a fun project! Design and sew your own unique purse using magazine pages reinforced with fusible web. Quilling, or paper filigree, is back in crafting style. It's showing up on scrapbooking pages and homemade cards. I wanted to try this craft I remember from many years ago. A traditional snowflake kit has sat in my projects bin for a long while, untouched. Then I saw the author of Twirled Paper on the Carol Duvall show. The fantastic underwater scene in bright colors and outrageous shapes was not the same quilling. I was intrigued, and I had a blast with this kit in a book. The designs are unique - animals, bugs, fish, aliens, food and letters. The book is colorful and friendly. Quilling is easy enough to teach children, while there are plenty of designs to keep busy at all skill levels. The designs are so creative and fun that I was inspired to create my own. 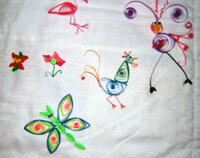 Here's a freeform design, "Kooky Bird." He began from some of my practice coils. As you can see, we used old record albums covered in waxed paper for our quilling bases. The book comes with everything you need to quill, except for some basic household supplies - waxed paper, straight pins, ruler, toothpicks. 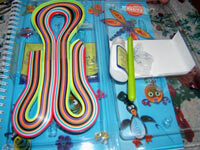 The kit includes: the quilling tool, glue, googly eyes, and lots of quilling strips in great colors. The first quilling technique is tight coils. Very easy and explained well in the text. Next, we moved on to loose coils, which are used in most projects and are turned into shapes to form your designs. Many different shapes are shown in a visual glossary, with diagrams. I referred back here as I made the designs. 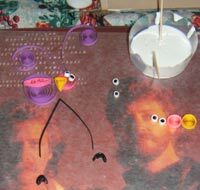 I followed right along with the pictures and directions to make a flamingo. If you would like to try quilling, buy this book. It's a great for learning quilling, with a casual tone and creative designs. I'm ready for my lacy snowflakes kit. Take a gander at our creations! Super Bowl Special from http://www.5bucksayard.com - FREE SHIPPING to the continental United States when you make a minimum of a $20 purchase. Hawaii, Alaska, and international shipping is 50% off. Special starts 12:01 a.m. CST Friday, February 3 and runs until midnight CST Sunday February 5, 2006. Specials on FQs and 1 yard bundles too. FREESHIP06A -free shipping on a minimum order of $100.00 or more. CHARM06A -10% off any product in the charm/charm bracelets section. CZECHGLASS06A- 10% off Czech Glass. AllCrafts.net is celebrating our 5th year online! We've grown over the years - 20+ crafts categories and more than 200 pages in the website. We're holding a year-long Celebration Sweepstakes, with a new prize each month. Current email subscribers to this newsletter are automatically entered, but if you'd like to update your info, use the entry form. Unlock the Secrets of creating a beautiful quilt using this simple 9 step system. Rag Quilt in a Weekend! Make this fast, fun and funky quilt in one short weekend, whether you are new to quilting or have been quilting for years. Send fabric greetings to your family and friends through the mail. In just 7 easy steps and using fabric scraps from your stash or brand new fabric from the quilt shop, their Valentine's Day will be one to remember.